Benzonatate, marketed under the trade names Tessalon and Tessalon Perles among others, is a non-narcotic oral cough suppressant, or antitussive, with effects that last from 6 to 8 hours. Since it is not an opioid, benzonatate is not as prone to abuse like some other cough medications such as codeine. Benzonatate was approved by the U.S. Food and Drug Administration (FDA) in 1958. Benzonatate is a butylamine, chemically related to other ester local anesthetics such as procaine and tetracaine. Benzonatate is thought to act as a local anesthetic, decreasing the sensitivity of stretch receptors in the lower airway and lung, thereby reducing the drive to cough after taking a deep breath. An antitussive, benzonatate is employed to reduce coughing in various respiratory conditions such as bronchitis, emphysema, influenza, and pneumonia. It should never be used to suppress a productive cough producing mucus that can be spit out, or in place of treatment of the actual cause of cough, such as asthma treatment. It has been used in small doses as a topical anesthetic for mouth or pharyngeal pain. This practice is not recommended, because the oropharyngeal anesthesia may result in pulmonary aspiration. Noted beneficial side-effect is the reduction or quieting of chronic snoring. 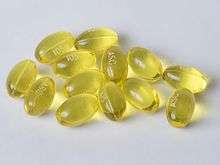 Benzonatate is sold as yellow or blue 100 mg and 200 mg softgel capsules. Initial dose is one 100 mg perle (gelcap) by mouth, 3 times a day. Dosage may be increased as necessary, up to a maximum of 600 mg per day. Due to its potency and potential toxicity, the capsules must be swallowed intact in order to allow slower release of the medication. Because it is not as effective or safe as codeine, it is typically recommended only in patients who are allergic to codeine. Reported side effects include drowsiness, dizziness, and dysphagia. There are reports of death related to overdose of benzonatate, mostly in children. Para-aminobenzoic acid (PABA) is a metabolite of the ester class of local anesthetics, which includes benzonatate, as well as procaine and tetracaine. Severe allergic reactions have been reported in patients who are allergic to PABA. Severe sensitivity reactions to benzonatate have resulted in respiratory side effects such as bronchospasm, laryngospasm and cardiac arrest. Excessive absorption of benzonatate (a local anesthetic) in the oral mucosa will result in the rapid development of numbness of the mouth and throat. In extreme cases, the mouth and pharynx may become so numb that pulmonary aspiration may occur. Excessive absorption of benzonatate will occur if the gelcaps are chewed or allowed to dissolve in the mouth. This may lead to an overdose of the drug. Overdose of benzonatate may manifest as central nervous system side effects, such as mental confusion and hallucination, restlessness and tremors, followed in extreme cases by convulsions and death. It is sold in the USA generically or under the brand name Tessalon Perles (gelcaps), Zonatuss or Tessalon Capsules. It is sold in other countries under various brand names, including Benzonatato, Benzonatatum, Benzononantin, Benzononatine, Exangit, Tesalon, Tessalin, and Ventussin. ↑ Crouch, B. I.; Knick, K. A.; Crouch, D. J.; Matsumura, K. S.; Rollins, D. E. (1998). "Benzonatate overdose associated with seizures and arrhythmias". Journal of toxicology. Clinical toxicology. 36 (7): 713–718. doi:10.3109/15563659809162620. PMID 9865240. ↑ Cohan, J. A.; Manning, T. J.; Lukash, L.; Long, C.; Ziminski, K. R.; Conradi, S. E. (1986). "Two fatalities resulting from Tessalon (benzonatate)". Veterinary and human toxicology. 28 (6): 543–544. PMID 3788039.